SUNRISE – While Tuesday night’s tilt against the Lightning will likely offer up a preview of what should be a competitive opening round playoff series, the Canadiens aren’t looking any further than game number 77 on their regular season schedule. That game-by-game approach is something head coach Michel Therrien has stressed time and time again during the year. The Canadiens bench boss isn’t about to deviate from that mentality as the bleu-blanc-rouge goes in search of a season-high sixth straight victory against a team that has lost once in regulation time in its last 10 games and trails them by just two points for second place in the Atlantic division standings. “We’re not looking too far ahead. We have to go one game at a time. That’s been our philosophy all season. We’re on a good swing right now. The team is playing well. I like the way we’re playing. 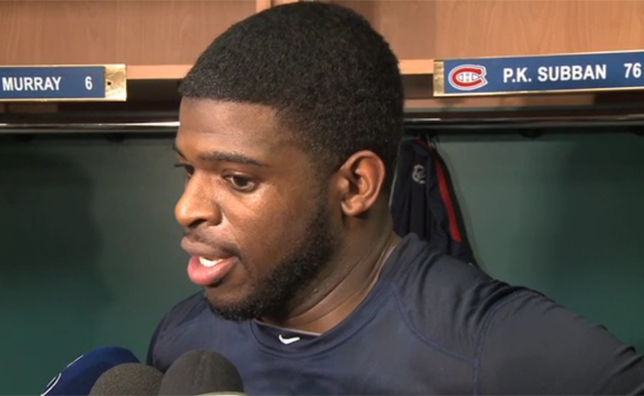 We have to continue in that direction,” said Therrien after the Habs’ practice at the BB&T Center on Monday. “You can take anything you want away from a game like this one against Tampa Bay. We can make predictions about what’s going to happen two weeks down the road, but what matters to me are the way we play and act, our focus and our execution. Interesting, yes, but like their head coach, Canadiens players are fully focused on the present and not so much on the future. That comes as no surprise given what the Lightning have accomplished as a group in 2013-14, staying the course through a devastating injury to superstar Steven Stamkos and the loss of Martin St. Louis and still managing to trend in the right direction under head coach Jon Cooper. To a man, the Habs admit there’s no reason to alter their mindset now, tempting as it may be to begin talking about a possible Eastern conference quarter-final matchup with Tampa Bay. Given the way the three previous meetings between the two teams have gone this season, two of which went to a shootout and one that was decided in overtime, it would be hard not to. Subban has a healthy respect for Tampa Bay’s competitive spirit and the effort they offer up night in and night out, one that will provide the Canadiens with another good test on the road to the start of the postseason. Come puck drop at the Tampa Bay Times Forum, that’s exactly what the Canadiens intend to do.